New Caney M.U.D. has not currently issued any water restrictions. Please continue to conserve, and thank you for your help. New Caney M.U.D. 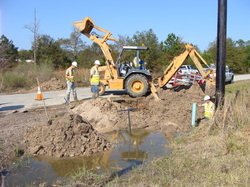 will be constructing new water mains on and around the Johnson road area, this is an effort to provide better service and fire protection. T.C.E.Q requires that each house have its own meter. Do you know how much water you are losing through that leak? The water that fills cracks, voids and other openings in beds of rocks, sand and soil is called groundwater. It is found in soils and sands that are able to retain the water — much like a sponge holds water — and is constantly replenished by rainfall or snow. Texas is blessed to have extensive groundwater resources. There are nine major aquifers (from which the groundwater is pumped) and 20 minor aquifers in the state, storing between three and four billion acre-feet of groundwater. Most areas of the state can draw water from one or more of them. All of the water we drink in New Caney Comes from Groundwater. The constant movement of water between the atmosphere, the land surface, and underground is called the water cycle, or hydrologic cycle. This movement supplies all the water needed to support life. 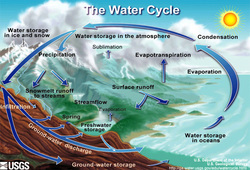 The water cycle is made up of five processes — condensation, precipitation, infiltration, runoff, and evaporation. Water vapor condenses to form clouds, which results in precipitation when the conditions are suitable. Precipitation falls to the surface and infiltrates the soil or flows to the rivers and streams as runoff. Surface water evaporates, returning moisture to the atmosphere, which will again condense to form clouds.